In your medium skillet, heat oil at medium heat. Add egg whites, milk, cheese, salt, and black pepper. Stir gently until nearly set, about 4 minutes. Add bacon and bread crumbs. Fold and stir until completely set, about 2 minutes longer. 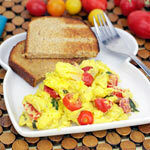 I use turkey bacon and skim milk in this recipe to make it more healthy. 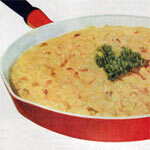 The bread crumbs give the scramble a hearty texture. 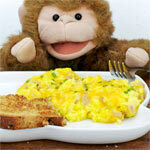 Mr Breakfast would like to thank scrambler for this recipe. 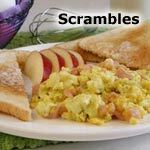 What do you think of Bread Crumb & Bacon Bit Scramble?